Instant Car Donation was founded with the goal of bringing donors and local charities together with an efficient and pleasant process. You can focus on deciding which of our respected charities is right for you instead of worrying about difficulties of researching how to make a donation. After your free pickup, we will assist you in recieving the best tax benefit possible for your generous gift. We take pride in helping smaller charities easily receive car donations, bringing people together while helping support those in the Longmont, Colorado community who need it the most. Here are some of our favorite charities in the Longmont area. We have made sure each of them are eligible for tax deductions when you help your local community by donating your car. Your values and choice can make a difference. The Association of Waldorf Schools of North America (ASWNA) was founded in 1968 to assist Waldorf schools and institutes in working together to nurture Waldorf Education so that it can manifest more widely in the world. Today there are over 900 Waldorf schools in 83 countries. In North America, there are more than 250 schools and 14 teacher education institutes in some level of development. AWSNA provides leadership to schools by facilitating resources, networks and research as they strive towards excellence and build healthy school communities. Through a three-pronged strategy of Educating Grassroots Practitioners, Advocating for Systemic Change, Capitalizing Indian Communities, First Nations Development Institute has been working to restore Native American control and culturally-compatible stewardship of the assets they own - be they land, human potential, cultural heritage, or natural resources - and to establish new assets for ensuring the long-term vitality of Native communities. First Nations serves rural and reservation based Native American communities throughout the United States. In 1972, the Longmont Branch of the Boulder County Humane Society officially became the Longmont Humane Society. The Longmont Humane Society is an open admission facility with a mission of: Caring, serving and educating to improve the lives of companion animals. LHS provides temporary shelter to thousands of animals every year: dogs, cats, small mammals, and birds who are lost, abandoned, or surrendered. Loving attention, nutritious food, meticulous health care and daily exercise are standard parts of the high-quality care provided to each animal. The OUR Center (Outreach United Resource Center) helps people move toward self-sufficiency by unifying community resources. The organization provides emergency services to help people through short-term financial crises and also works in partnership with our clients to develop case plans for those needing longer-term assistance. The OUR Center offers programs ranging from emergency assistance with rent, utilities, food, clothing, shelter, and transportation, to longer term programs that help many of our clients solve underlying problems such as financial difficulties and unemployment. These longer term programs are handled by trained case workers, who help each client discover his or her own personal resources, strengths, and skills. Clients are taught useful life skills, problem solving, budgeting and planning. OUR Center case workers also coordinate with and connect clients with other community resources needed to create financial stability for themselves and their families. Project Sanctuary is a therapeutic military family program that focuses on the needs, challenges, and concerns that our military families face every day. We work with veterans, active-duty service members, and their families with our exclusive three part A.R.T. program, combining counseling, education, self-development, and recreational therapy to help build well-adjusted families. We assist the military service members by helping them heal from the effects of war, providing a safe place to heal, helping reconnect the family unit and treating all members of the family at their level of need—which enables the service member to reintegrate into their family and community successfully. Our programs focus on the entire family's mental health and well-being first as we take them through the steps towards creating a sustainable balanced and thriving family– and life. There are many non-profit organizations, for example First Nations Development Institute, in the regional Colorado area which may benefit from your automobile donation. We not only help you contribute to a charity, but we concentrate on providing an simple method to small they can focus on their important work to take donations. Frequently the donation is likely to make the largest difference for such charitable institutions, such as Longmont Humane Society, while helping support those within their Longmont community who need it the most, bringing individuals together. It is important to Instant Car Donation which you receive the allowable tax deduction advantage without needing to navigate complexities or perform research, possible. We pre-qualify all our participating 501-3C non-profit charities to verify your donation will be tax deductible. The procedure will be streamlined for both you and the charity of your choice. We'll provide you following your finished donation with a 1098-C tax form. Car donations are the way for folks to produce a large contribution. Because of this, one of their aims is to empower those making such a choice by making sure that the car, like a Kia Optima, goes to the charity which reflects their values. When donating together with us we consistently make charity choice an essential part of the procedure. We can do that too in case you need us to pick which charity, for example Longmont Humane Society, would benefit the most rather. When you have a charity in mind you would like to contribute to, then you can donate with us. When there are numerous benefits to charities which receive donations from individuals, the benefits to the you, the donor may not be too clear. The largest benefit that the majority of people today hear is the opportunity for a tax benefit. This usually means that the resale value of the donated vehicle can be written off on your tax return. There are a few limitations on this sort of deduction, so you could want to speak with a tax pro before making the donation. An additional advantage of donating a used auto to charity is your opportunity to simply get rid of the automobile without having to try to fix or promote it. Most charitable automobile donation plans will except vehicles whether they're operating or in need of repair. Some trucks or cars that are beyond repair will be sold for parts or waste and any money received will go to the charity. Car donation programs are becoming more popular in Colorado over the previous decade or so, as more charities are searching for new and creative approaches to create funds. Nowadays, the number of charitable vehicle donation programs is in the hundreds or even tens of thousands. When you've got a favourite Longmont charity you like to make donations to, it's probably possible for this charity to get at least a part of the funds when you give your used vehicle, like your Plymouth Champ. Besides the charitable tax deduction rather than getting the hassle of managing an older automobile, the sensation of being able to help those in need may be the best reason to give your car to a charity. Most used auto donation programs will either sell your vehicle to increase funds for the reason, utilize the vehicle in the everyday operations of the company, or give the car to a someone who needs help either at no cost, or even for under the fair market value. Charitable car donation programs enable you to give your secondhand car to the charity of your choice. Visit our charities page to pick a charity in Colorado to contribute to. When you opt to make a donation of a used car, when the charity sells the car for over $500 they have to send you a receipt which allows you to subtract the sales price of the automobile in your tax return. If the older car you opted to donate is not worth at least $500, then the IRS lets you ascertain the fair market value. This is the value that someone would be happy to pay for the automobile if purchasing it from you. You claim the tax deduction, and the charity either gets to utilize the automobile, such as your Acura SLX, sells it and uses the proceeds for the good of the charity. That's a wonderful thing for everybody involved. We can ensure your car belongs to some charity that's qualified for tax deductible contributions and assist you recieve a reciept for your contribution. You might be able to receive a tax advantage should you itemize your deductions. For contributions up to $500 it is possible to utilize Kelley Blue Book and for larger contributions the non-profit organization needs to verify what they recieved to the auto donation (more information). 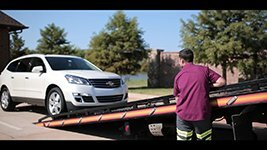 We'll organize a tow truck to come pick up your vehicle, such as your Cadillac XT5, and deliver it to the charity of your choice. It could not be much easier to help the non-profit organization, like OUR Center, of your choice! Do you take donations for cars and trucks that are damaged or missing parts? We take cars in all states! Go to the form and ask to donate, and we will quickly see what we are able to do for you. Can you help me find a Longmont non-profit organization that is suitable for my personal principals? We would like to help you ensure that that your donation goes to a cause in Longmont you care about by helping you select a non-profit organization that fulfills with your values. In actuality, this is so important to us we do so every single time you donate with us! What non-profit organizations do you support in Longmont? Instant Car Donation proudly supports respected national and local Longmont nonprofit organizations in your area. Our Longmont team works hard for you to guarantee the organizaion becomes maximum support from your vehicle. All owners on the car title must complete the section of this title labeled "assignment of title by owner" or "transfer of ownership by seller". Most states require registering and printing owner names. You should fill out any fields that need information concerning a buyer/purchaser/transferee with info about who you are donating the automobile, such as a Honda Insight, to. You might find instructions here. First we'll get in touch with the charity, for example OUR Center, of your choice (or pick one for you if you requested that rather than picked) to make sure they want your vehicle, like your Avera Motors Avera Motors, which takes about one business day. We'll arrange to come for pickup. If it is taking a little longer don't hesitate to get in touch with our support team. Are you considering donating a vehicle in Longmont, including a Lexus LX, however, wondering what effect this may have for the charity of your choice? If this is the case, keep reading to see how your car donation in Longmont could be a real difference and influence on small and medium-sized charities such as First Nations Development Institute in your area. One of the biggest challenges for small charities with few or no paid staff is how to increase their funding and avoiding volunteer burn-out. First Nations Development Institute at Longmont, Colorado, is this a nonprofit. First Nations Development Institute's assignment is performed by lots of volunteers. Since the majority of work is accomplished by volunteers, so the charity's jobs are carried out by volunteer employees, many of who lack skills the non-profit needs to flourish. In fact, many times that the details of fundraising efforts are decided based on who is available to carry them out, instead of that which are the best approach to fundraise. Should a small nonprofit like OUR Center be able to receive a auto donation, such as a Nina 4 Door Sedan? We believe so! But what about all of the logistical help, money and time that's required to organize the tow truck and also the sale of your donated car at an auction? It seems improbable that a charity such as this would truly have the ability to take on promoting your donated car, even if you decided to donate it to them. That's where we come in. We partner with any and every non-profit who wants to get a automobile donation, like Longmont Humane Society, and offer our expertise and help in calculating the automobile donation. Then, we be sure that the charity gets the utmost donation it can receive so it can increase its operating funding and finance new and present programs. Your car donation could be worth several hundred or even several thousand dollars or more, depending on the car that you donate. Although it may not seem like a great deal of cash, it's an unplanned windfall to get a small or medium-sized charity such as OUR Center. Still considering donating your car to a charity in Longmont? We can assist! Just click on the contribute button and then let us know that you are, and we'll arrange your free pickup and to offer your car. We'll also get hold of the charity of your choice, and make sure that they receive the money they need to continue their great and important function in our community community. When you contribute a vehicle, like a FISKER AUTOMOTIVE Karma, then you can contribute from the center. There are a lot of deserving charities out there which are needing your help, particularly in Longmont. Require Association of Waldorf Schools of North America in Longmont, Colorado. This a terrific example of a charity which touches the lives of numerous in the local community. We can not do the important job that First Nations Development Institute does, but we can all give a hand to enable and further its mission. Have you got a car in need of a new home? Before you click the donate button, take some time to check through the numerous pages of charities, like Family Legacy Missions International, that we partner with. Which of them speak to your heart? Then take a minute to reflect. What wishes do you have for your people of the area? After that, imagine how by even carrying an action as little as donating your vehicle in Longmont, you are in a position to help make those fantasies come true. Imagine what string of events that your automobile donation might set off in Longmont and beyond. Do the wishes you have go past the pages of our site? Probably. We must all dream enormous, especially when it comes to the great wishes and joy which people earn for others. But some us of might realize that the charity we want to contribute our car is not listed on this website. We can help! You can still click the donate button and let us understand that there's a respectable charity, such as Oregon Health & Science University Foundation out there that that isn't listed on our website. We'll contact that charity and use our tools to be certain that it can receive your donation. The procedure is simple. When you click the donate button and then let us know you are ready to donate your car, like a Volvo 960 Series. We will organize a free pick-up for your car in Longmont or the neighborhood region, and list on the auction to find the maximum price possible so we could produce the utmost donation possible to the charity of your choice, such as OUR Center. Not only can you get to give your vehicle from the center, but you are also eligible for a tax-deduction. We will finish your tax receipt and supply the non-profit with needed IRS paperwork as well as your contribution. Giving from the heart couldn't be simpler! Once you give a car, like being a Daewoo LEGANZA, you're linking the countless Americans who contribute to charitable causes every year. You might believe that you do not have enough money or resources to genuinely contribute to a cause you rely on. However, donating a car is among the best ways which you can add your aid your favorite local charity, such as OUR Center in Longmont, Colorado. Even though it's really a small action, your community in Longmont, Colorado and outside will thanks! In actuality, at 20-16, charitable lending was measured about 390.05 million dollars, or 2.1 percent of their GDP for the exact same year. It's likewise reported that charitable giving has increased year almost every year since 1976. Even more surprising is how young adults today give even more than their seniors did, even if they were the exact same age. Are you surprised that Americans devote so far and in lots of ways? You may think about, how would you best talk about the resources you have to generate the local community you are living in a much better place? For those who have a vehicle, such as being a Dodge 400, which you're not using, or will be sitting in your own garage or driveway, why do not donate to get a charitable cause? Whether your vehicle be new or old, working nicely or needing to another lifetime, it is possible to donate it to the charity of one's choice farther its crucial assignment. Especially, small and medium sized nonprofits like Longmont Humane Society are in serious need of extra funding as a way to enhance their reach into the local community. Charities like First Nations Development Institute in Longmont, Colorado, are always needing to windfalls to increase or enlarge their own charitable activities. Once you donate your vehicle, you breathe new life in these critical apps, as you help them receive unexpected new funding. Giving ought to be easy, shouldn't it? We think so too. To contribute your vehicle, whatever you have to do is click on the donate button. We'll contact you to set up a complimentary pickup for your vehicle in Longmont, Colorado or the neighborhood area. . All you have to do is tell us that honored charity, such as for example Big Brothers Big Sisters of Tampa Bay, you'd really like to benefit during your contribution, and we are going to take care of the rest. We associate not only all of the thousands of charities listed on our website, but should you wish to help a charity that people don't currently list, we will get in contact with this charity to get you so as to complete the donation procedure. We will also supply you with paperwork that will help you to get the most tax-deduction for the donation! Donating your vehicle is a win-win every time! Do you have a vehicle, like a FortuneSport VES Rt.S, simply sitting in your garage or in your driveway that you've been intending to get rid of? Maybe you think that it is too old, or that it's in need of repair or refurbishing. Many of us are eager to leave an unnecessary automobile sitting in our garage or our driveway for a long time without even spending the time or money to fix it. We think that eventually we'll get around to selling it to get a little bit of extra money, but it is at the base of our list of priorities. So that auto sits and sits and sits. Let's be fair. Are we really going to put in time and cash to fix that car? If we had been, would not we've done it? Not only is that older car an eyesore, but we are also overlooking the chance to use this valuable resource to enable a charity like Women's Law Project! 1 man's crap is another man's treasure, or so they say. This is surely true with car donations. A vehicle, including a Koenigsegg Automotive Koenigsegg Automotive, that is unnecessary by you might provide just the correct amount of financing to some charity at Longmont or beyond to fulfill its budget for a present or future project. If you donate your vehicle, you're giving a valuable treasure to a charity, as your contribution helps them to continue their important work locally. First Nations Development Institute at Longmont, Colorado is this a nonprofit. Its call to activity is directly encouraged by your donation--you can assist the charity of your own choice, like Longmont Humane Society, to expand the reach and breadth of their great actions from the neighborhood! We pride ourselves in assisting you to convert your unwanted auto to real treasure! Click on the donate button today to begin the process. When you let us know which you are prepared to donate your vehicle, we will arrange for a free pickup in Longmont or your neighborhood region and sell your car. All you will need to do is let us know which admired charity meets the call of your spirit, and we will finish up. The very best part is that while you receive the advantage of clearing out old, unnecessary junk, you also get to offer financing to the charity of your choice, like Feed My People, and finally, you get the most tax advantage for your contribution. We will supply you with a tax receipt for your donation, and make sure that the charity of your choice receives the donation as well as the necessary IRS paperwork to take your donation.